Just for the Rule of Fun. Backyard Sports, formerly called Junior Sports, is a sports video game series originally made by Humongous Entertainment, which was later bought by Atari. It is currently owned by Day6 Sports Group, who has since rebooted it as a Mobile Phone Game series, which is far from the series' original computer game roots. It is the only game series that had licensing from all the major professional sports leagues in North America: Major League Baseball, Major League Soccer, the National Football League, the National Basketball Association, and the National Hockey League. Backyard Skateboarding (which has only produced one game and its Game of the Year Edition). The series has also spawned a TV special (NFL Backyard Basics: Football Tips from the Pros) and a few books, as well as a Comic-Book Adaptation (a prequel to the game Sandlot Sluggers). The series was originally only Competitive Multiplayer, but starting with Backyard Football '10, Co-Op Multiplayer is also in the games. A demo version of Baseball 2001 can be downloaded from Infogrames, and a trial version of Sandlot Sluggers can be downloaded from Atari. In April 2016, Cross Creek Pictures and Crystal City Entertainment acquired the film rights to the series . Anachronism Stew: The pros being kids in modern times. Not only that, but also by the time some of the pros were born, others would've already been teenagers or even adults. NFL Backyard Basics handles this by having the present-day pros turn into kids while they're in the Clubhouse. Ascended Extra: In Baseball, Vinny the Gooch mentions a former Rockets player named Joey MacAdoo. Nine years later, Joey is one of the new Backyard Kids. Big Brother Worship: Amir Khan, to Achmed. In some games, he even gets a massive stat bonus if he and Achmed are on the same team. Celebrity Power: The pros, who are always better than the neighborhood kids. Justified if you think about it, since the pros specialize in their respective sports while the neighborhood kids play many different sports. Chuck Cunningham Syndrome: 13 characters. Commuting on a Bus: Amir, Gretchen, and Stephanie in Backyard Baseball 2007. Conspicuous CG: When the player sprites were changed to pre-rendered images, the spectators in the background were still 2D drawings. Likewise, when the camera zooms in on the game (i.e., when someone's at bat or doing penalty kicks), the players look like cartoons again. Cousin Oliver: Joey, Samantha, and Arthur. Desk Jockey: Many of the announcers. Dummied Out: Area 51½/A Nameless Field from the Soccer series. Early Installment Weirdness: The first three games seem heavily stripped down compared to the later ones. The first two lacked the pro players that would become such an icon of the series mere years later, Baseball only allows for one-color teams instead of two, the menu navigation was completely different and did not use the streamlined forward-and-back arrow mechanic, the player stats were measured on a one-to-four scale instead of one-to-ten, you couldn't pick a home field for a season game, and several other things that would be considered major staples are completely absent (for instance, the "power-up obtained" sound). The outfield viewpoint also featured hand-drawn figures instead of the CGI ones that became more prominent later on. Five-Token Band: The series featured 30 characters and lot of them were ethnic, so most of the time you could make your team like this trope. These included nine blacks (Keisha, Jocinda, Dante, Stephanie, the Dobbs, Mikey, Ricky, and Ernie), three Hispanics (Maria, Jorge, and Pablo), three Asians (Luanne and the Kawaguchis), two Arabs (the Khans), and thirteen whites (Annie, Billy Jean, the Webbers, the Delvecchios, Lisa, Dmitri, Gretchen, Kimmy, Pete, Reese, and Marky). Four-Fingered Hands: Most characters have these. Genre-Busting: The series in its early days runs on the SCUMMnote Script Creation Utility for Maniac Mansion engine, mostly used for LucasArts adventure games and the other Humongous Entertainment series. While the point-and-click aspect remains, mainly for menu selection and player drafting, seeing an adventure game engine run a sports game seems bizarre. Geographic Flexibility: The Neighborhood changes in every game. Holiday Mode: Some games have a dynamic menu that changes with the season. However, in all games, playing the game on a kid's birthday will buff their stats for the day. Hurricane of Puns: Many teams in the original Backyard Soccer have names that are puns. In-Series Nickname: Every playable character has one. There are only a few real-life players who actually have their real-life nicknames in-game: Carlos "El Pibe" Valderrama, Zach "The Beast" Thornton, Frank "The Big Hurt" Thomas, Randy "The Big Unit" Johnson, and a couple others. Jack-of-All-Stats: Meta-example—the neighborhood kids are always overshadowed by the pros because the pros specialize in their respective sports, while the neighborhood kids play many different sports. Each specific game also has their own general Jack of All Stats. Ex. in Baseball 2001/03, it's Sally Dobbs, and in Soccer it's Lisa Crockett. Lampshade Hanging: The announcers often do this. Leitmotif: Every playable character has one. When the games went 3D, each character got a new leitmotif... except Pablo. Lighter and Softer: The series became this over time, despite attempts to make it Darker and Edgier. Loads and Loads of Characters: 30 main characters plus countless others. Mad Libs Dialogue: Sunny Day. Her partners avert this, however (as does Sunny herself in NFL Backyard Basics). Market-Based Title: The series is sometimes called Junior Sports, its original title, in Europe. The Missingno. : The generic kids can be put on your team in Backyard Baseball through editing the coach file , but since they were never intended to appear on the Strategy screen or Meet the Players their graphics are garbled into pieces from other graphics. At worst, they crash the game from trying to display non-existent ones. This is averted in games starting with Backyard Hockey however, as they are all properly set up yet only scripted to not appear on the bleachers. Not Quite Starring: Obviously, the pros do not do their own voices (except in NFL Backyard Basics). Only Known by Their Nickname: The custom players, due to technical limitations — except in early games where it was just "Custom Player". Only Six Faces: There are only a few "custom" player faces available. Overshadowed by Awesome: The kids, by the pros. Parental Bonus: The references to 1980s culture. Product Placement: Parodied with 110% Juice. Punny Name: The announcers and certain unlockable players and coaches. Race Lift: The generic season kids have a different appearance in every game. Secret Character: There have been many, Mr. Clanky being the most common. Self-Imposed Challenge: A relatively popular one is picking all the worst players on the highest difficulty and trying to go undefeated in Season Mode. Doubly so in the games that include the pros. Spotlight-Stealing Squad: The pros, again. As of Backyard Sports: Sandlot Sluggers, they were gone until the handheld games in 2015. Stealth Pun: Sunny Day's name is a nod to the name of Humongous Entertainment's co-founder Shelley Day. Team Shot: In every game except Backyard Skateboarding. Tie-In Novel: The Backyard Books. Took a Level in Badass: The kids' stats vary between sports, causing kids with awful stats in one sport to suddenly become very good in another. For example, Ricky Johnson has a terrible batting stat in Baseball, but is an excellent kicker in Football and Soccer. Some also invert this trope, going from being good to awful. Unnamed Parent: No kid's parents have names. "Where Are They Now?" Epilogue: Upon winning a championship, photos of your team's players celebrating their victory are usually shown alongside the credits. How they celebrate depends on the game. Wolverine Publicity: Oooooh boy, the pros. This was actually a bit gradual though; in the original Football, Steve Young is on the cover, but Jocinda and Amir are front and center while Steve hangs in the background. Then on Baseball 2001, Cal Ripken is the most predominant character on the cover, but Stephanie still stands out quite a bit, so it's about half-and-half. Soccer MLS Edition is where this starts to kick in though — Brandi Chastain and Cobi Jones now are front and center on the cover while Reese sort of floats in the background. Then comes Basketball where a single pro takes up more than half the boxart complete with his real-life portrait next to him, while some random Backyard Kid floats off in the background. And finally with Basketball 2004, there aren't any Backyard Kids at all on the cover...then it somehow manages to escalate even more with Skateboarding GOTY where Andy MacDonald is the only kid present across the entire box. Yes, that includes the back of it too! Either way, the pros gradually took up more and more of the advertising until one has to wonder if the marketing team even remembered the Backyard Kids were in the game too, even though they always represent half (or more) of the cast. World of Pun: Most team names are puns, as are those of most of the announcers. You Gotta Have Blue Hair: Many characters in the later games have weird hair colors. Abandoned Warehouse: A stage like this, appropriately called Vacant Warehouse, appears in Backyard Soccer. All Deserts Have Cacti: Cactus Gulch in Backyard Football. Area 51: Area 51½ (also known as A Nameless Field) from the Soccer series. Artifact Title: Some of the games, especially later ones, feature no backyards at all. This is most prevalent with Backyard Hockey, where none of the rinks take place in a backyard, and a good majority of them aren't neighborhood rinks either. Artificial Stupidity: The Mul-T-Puk air hockey minigame in Backyard Hockey has exceptionally stupid AI. This video says it all. Ascended Glitch: The infinite ollie bug in the original Backyard Skateboarding was patched in the GOTY edition, but did get the honor of getting a new power-up that accomplished a very similar effect, possibly to an even greater degree than the original. The turbine power-up allows you to jump as much as you want, and unlike the infinite ollie bug, you don't have to charge it, you can just spam the heck out of the space bar and your character goes flying. Awesome Music: Invoked and lampshaded in Backyard Baseball 2001/Soccer: MLS Edition/Soccer 2004; one of the Credits Gags is "Click here to listen to the awesome credits song. Oh, and see the Smarty Pants who made this game." Banana Peel: There is a powerup called Banana Peel in Backyard Hockey which sends the opponent into a Slippery Skid, even though there is no actual banana peel in the powerup except for the icon. Barrier Warrior: A force field that lasts a few minutes is a powerup in Backyard Football. Battle in the Rain: The opening cutscene in Backyard Football 2002. Bigfoot, Sasquatch and Yeti: There is a Yeti team in Backyard Hockey 2005. Bowdlerization: In most professional hockey games, a fight will break out to settle a disagreement. Needless to say, that sort of violence would never fly in a game intended for kids, so the Hockey series will have fouls or roughing settled by...a game of RockPaperScissors. Buddy Cheque even lampshades it, by saying it's "what the fans pay to see" despite how mundane it is. Continuity Nod: from Baseball 2005; in Starlite Orchards, you can see the intro movie from Football 2002 playing on the big screen. Also, Buddy Cheque (the Hockey commentator) makes an offhand reference to Vinnie the Gooch, the original commentator for the Baseball games. Continuity Reboot: Arguably, Backyard Baseball 2007. Covers Always Lie: Although Soccer 2004 was the last game to feature the kids' original designs, the box art depicted their then-new appearances. Clock Tower: There is one in the neighborhood in Backyard Skateboarding. Credits Gag: If you simply hover the mouse over the credits button in Backyard Baseball 2001, Backyard Soccer: MLS Edition and Backyard Soccer 2004, you get some humorous messages at the bottom of the screen. Deadly Gas: A powerup in Backyard Football 2006. Defeat Means Playable: Backyard Skateboarding, for the bosses. Also, Jimmy Knuckles in Sandlot Sluggers. Department of Redundancy Department: Football 2002 has the NFL license, and thus the Miami Dolphins are a playable team. However, one custom team name is the Orcas, which are a species of dolphins. Do Not Touch the Funnel Cloud: Played straight in Backyard Football, where the twister powerup blows the opponents away when they touch it. Drive-In Theater: Starlite Orchards Drive-In in Backyard Baseball 2005. Easier Than Easy: T-Ball mode in Backyard Baseball. Easter Egg: All your base are belong to Humongous. Entering "Houstons" as a coach name in Backyard Football 2002 adds the Houston Texans as a team name and logo. In the original Football, the kicker for the Dolphins in season mode is named Ray, the same name as the kicker who wanted to kill Dan Marino (who happens to be in the game himself). Fantasy Helmet Enforcement: In Backyard Skateboarding, a message shows up saying that kids should always wear helmets and pads while skateboarding. Feelies: Earlier installments came with promotional cards of the Backyard kids and pros. The ones that came with Baseball were an Obvious Beta, however, as some kids' clothes are differently colored, and their pitching and fielding stats are inaccurate and labeled as "Throwing" and "Catching". Fire, Ice, Lightning: Powerups in Baseball are based off all three, along with water (the spitball). Follow the Leader: The 3D Football games are similar to Madden, while Skateboarding copied the gameplay of Tony Hawk's Pro Skater 4, right down to the control scheme. Flying Saucer: In Wheeler Acres in Backyard Baseball 2005. Friendly Local Chinatown: A stage in Backyard Football 2004. Ghibli Hills: The forest in Football 2006. Glorious Mother Russia: The Cagey Bees team in Backyard Soccer. Guide Dang It! : Merry Olde Englandland in Backyard Skateboarding has coins that are on top of the castle towers, but there is no way of reaching them normally, which is a pretty bad thing in a game where hard-to-reach areas are usually accessed by grinding on hard-to-see power lines and wires. What's the solution, you ask? You jump into perfectly normal looking rocks which teleport you to the towers. There is no hint in the entire game that you're supposed to do this, and on top of that, it doesn't even work on all the rocks! The Game of the Year Edition partially solved this by adding wooden arrows pointing to the specific rocks, but even then, that's still hardly an indicator the rocks actually do anything. Hyperactive Metabolism: Juice heals you in Baseball and Basketball. An Ice Person: Freezing is a powerup in several of the games. It's Always Spring: Averted in Football 2004, where the climate changes with real-world climate. Joke Item: The powerup The Fang in Baseball. It will always be a ball even if it is thrown in the strike zone. Lethal Joke Item: It's designed to trick the batter into swinging (if they do, they'll always miss). Actually you can get it in the corner of the strike zone if the player's strike zone is big enough. Kung-Fu Sonic Boom: The Sonic Boom powerup in Football. Limit Break: Hot Hand and Dunk in Basketball. Loading Screen: In Football 2006. Madden Curse: Much like the trope namer, the cover athlete in Backyard Football was also stricken by bad luck during the season. In the original game, Steve Young suffered a career ending injury in the 1999 season. In 2002, Drew Bledsoe got injured and Tom Brady stepped in (and the rest is history). Jeff Garcia (2004) became a journeyman after that season, and Daunte Culpepper (2006) blew out both of his knees and wound up in the now-defunct UFL. While Tom Brady (the 2008 cover star) guided the Patriots to a perfect regular season, they lost the Super Bowl that year. Make Me Wanna Shout: The Screaming Line Drive in Baseball. Meaningful Name: In Backyard Hockey, Beverly Backstop is the best goalie in the game...because she stops the puck. Millennium Bug: The original Baseball (released in 1997) has an example of this. In certain instances, whenever the game tries to render a date with the year as 2 digits, years 2000 and later will be presented as numbers 100 and larger. Multi-Mook Melee: In Baseball 2005, the Fielders' Challenge is against an endless team of dummies. No Animals Were Harmed: From the original Baseball 's credits: "No hot dogs were consumed in the making of this game. Okay, maybe a few." No Communities Were Harmed: Tokyo Field in Baseball 2007 is an obvious replica of Tokyo Dome. No Ending: Football on the GBA has no ending at all. You don't even get a trophy for winning the Cereal Bowl. Nostalgia Level: Steele Stadium in Baseball 2005, looking exactly as it did in the original (except it is in 3D). In the original Baseball, the only way to get a batting power-up was to make a successful base hit off a special pitch. However, in order to get a special pitch in the first place, the pitcher has to strike someone out. Obviously this meant a skilled player might never have the opportunity to ever obtain a batting power-up. Baseball 2001 fixed this by also making them obtainable through double plays. Football 2002 had a power-up called the Invincible Run. It was extremely unbalanced and did little more than make a touchdown completely guaranteed unless the player ran across the field way in advance until the power-up wore off, but even then the if the opposing player was anywhere past a third of the way down the field, the power-up would last too long and the running back would typically make it to the endzone before it wore off. The GameCube version Nerfed this pretty considerably by having the running back slow down every time he was tackled when the power-up was in effect. Oddly Named Sequel 2: Electric Boogaloo: Backyard Soccer: MLS Edition is the only one to not be named after a year, up until Sandlot Sluggers. Old Save Bonus: Having a Basketball PS2 save file unlocks Barry Dejay in Baseball PS2. One Stat to Rule Them All: Batting in Baseball. Outside shooting from Backyard Basketball. Create a custom character, max that stat, repeatedly throw 3-pointers from anywhere on the court. One Steve Limit: Happens in the original Baseball and Soccer. Averted in the later games, due to the pros — I.e. Lisa Leslie and Crocket in Basketball. Palmtree Panic: The Boardwalk in Baseball 2005. Patchwork Map: The island in Football 2006. Powerup Letdown: The Chameleon play in Football, which turns your team uniforms into the offense uniforms. It really backfires, as it's still easy to tell what players are yours, and it's impossible to fool the computer. 2-player mode doesn't do any better; you can't highlight the pass icon over the defense, so the power up becomes worthless. Product Placement: In Soccer 2004, Carlos Valderrama mentions that his favorite TV program is Blue's Clues (which counts as one of Humongous' self-promotions, as they made many of Blue's Clues' Licensed Games). Recycled INSPACE: Football 2006 is Football... ON AN ISLAND! Retraux: Babe Ruth in Backyard Baseball 2009 is done in a retro style. Roger Rabbit Effect: NFL Backyard Basics. Save Scumming: The six save slots in the original Baseball were probably meant for this. Typing in certain names for your coach in Hockey gave you three different teams featuring the game's art staff, producers, and programmers as kids. As well, in Football 2004, Rhett Mathis, the original games' music composer, can be seen as an NPC kid on Season Mode teams. Shout-Out: Angela Delvecchio was the main character in a Friend to Die For . Jorge Garcia is the name of a comedian, best known for his role of Hurley in Lost. This may have been unintentional, because the games came out years before Lost premiered. The Weber sisters are based off the Williams sisters . Although probably not intentional, Ronny Dobbs is also the name of quite possibly the most well known recurring character from Mr. Show. Baseball 2003 has Keisha Phillips enter with her saying "Uh, oh, here she comes" (the hidden captions add "Maneater" at the end; making this a reference to the 1982 Hall & Oates song "Maneater"). In Baseball 2005, go into the Record Book and look at BBL Champions. Bob Loblaw is a default one. In Hockey 2005, one can find Freddi Fish and Luther frozen under the ice in Mammoth Cave. Silliness Switch: Cheat codes in Basketball for the PS2 make really big and small heads. Even more so in Football 2006, where cheats can give characters big/small heads, big/small hands, etc; even different footballs— from a watermelon to a chocolate eclair to a banana slug. Single Pallette Town: Cyan Lane (which is, well, cyan) in Football 2006. Slippery Skid: A powerup in Hockey causes this to happen. Soundtrack Dissonance: The pros in Soccer: MLS Edition did have unique themes, but they can't be heard in the "Meet the Kids" screen. Instead, the menu song/previous kid's theme keeps playing, resulting in things like a lot of pros using Billy Jean Blackwood's cajun leitmotif. Spinning Paper: Whenever you unlock something in Baseball 2005. Sprint Meter: The juice meter in Baseball. Sprint Shoes: There are sprint skates in Hockey. Stealth Pun: There are a few examples, such as Duksana Pond in Hockey. In some of the pros' endings, they are checking out something related to their team name. Stop Poking Me! : One of Kiesha Phillips' quotes in Basketball is "Stop that clicking, man! It tickles!" Stuff Blowing Up: The Bomb Ball in Soccer. Super Mode: There is an invincibility powerup in Hockey. Super Speed: A powerup in Basketball, Hockey, and Skateboarding. Take That! 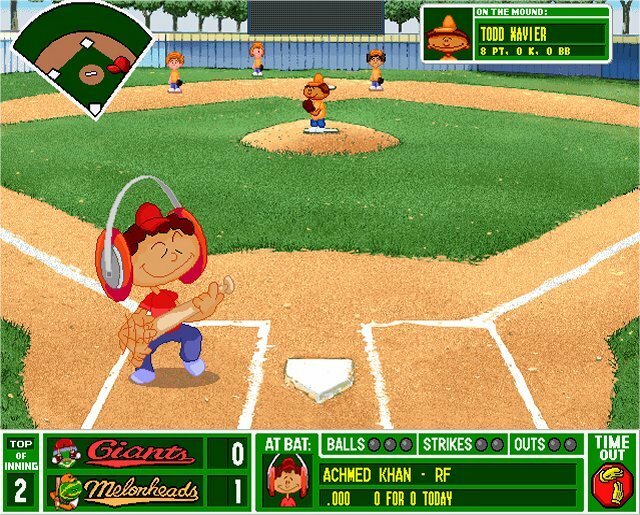 : Not in the game proper, but in a pitch for the original Backyard Baseball that former developer Richard Moe shared on the Humongous Alumni page on Facebook, there was one pretty harsh one towards EA Sports games. Designed for kids aged 5 to 10, Backyard Baseball will provide all the gripping realism of an adult-style baseball simulation but allow you to actually win, instead of having the computer beat you every single time by a score of 12 to nothing and you get so mad you want to rip the CD into little shreds and call up EA Sports and tell them how crappy their little game is because you can never get a hit, let alone a win and whats the point of playing if you cant do well at all, even once in a while, is that too much to ask? Tomorrowland: Quantum Field in Baseball 2005. Toon Transformation: The pros who visit the Clubhouse in NFL Backyard Basics. The Trope Without a Title: A Nameless Field (also known as Area 51½) from the Soccer series. Under the Sea: The Aquadome in Baseball 2005. The Voice: The mother calling for dinner in Dobbaguchi Arena in Basketball. The GBA games, except Football, which has no ending. Backyard Baseball 2001 and Soccer: MLS Edition removed the rewards for winning, besides getting a picture in the Hall of Fame. In the Football games on the PC, beating the game as Mr. Clanky's Tackling Dummies gives you a simple victory photo. Justified as this team only consists of robots who probably aren't programmed to ride rides at an amusement park. Sunny Day: "This is Sunny Day, signing off!"